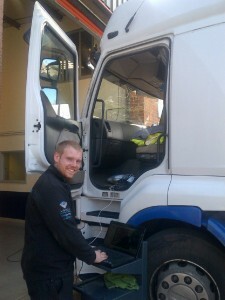 Adblue Removal, Adblue reduction and Adblue Deactivation. How the Adblue and SCR System Works Adblue is the registered trademark for AUS32 (Aqueous Urea Solution 32.5%) it is a chemical solution used in a process called Selective Catalytic Reduction (SCR) this helps to reduce emissions of oxides of nitrogen from the exhaust of diesel vehicles. Adblue is used by an advanced pollution control technology installed in the exhaust system called Selective Catalytic Reduction or SCR. SCR systems work by reacting AdBlue with the harmful NOX (nitrogen oxide) gases in the exhaust to form harmless water and nitrogen. All European truck manufacturers currently offer SCR equipped models, and the future Euro 5 and future Euro 6 emission standards are set to reinforce the demand for this technology. Adblue is expensive – so is Adblue removal an option ? Lets be very clear, Adblue is a legal requirement inside the EU. All European truck manufacturers currently offer SCR equipped models, and the future Euro 5 and future Euro 6 emission standards are set to reinforce the demand for this technology. Adblue Removal Export Truck and HGV Adblue Deactivation If you are operating a truck or HGV outside of the EU or you are planning on exporting trucks into a market where Adblue is either not required or Adblue is not available we can help.